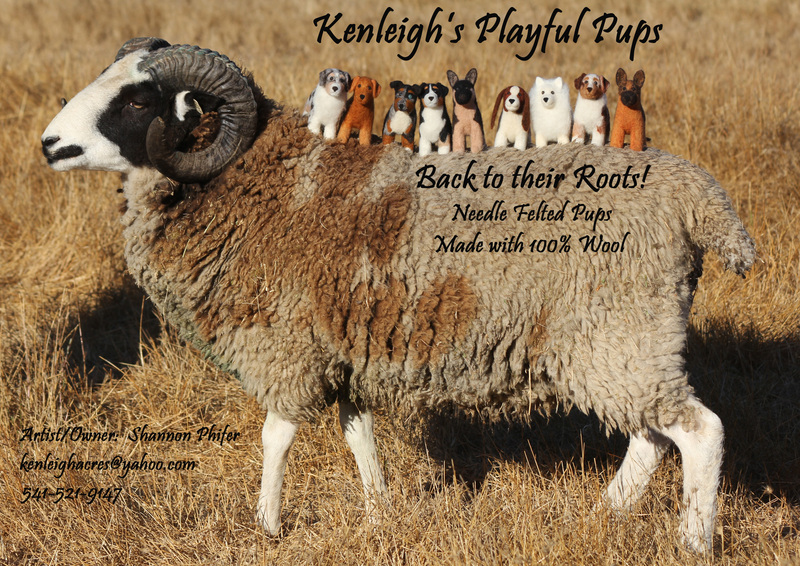 On my Kenleigh Acres Facebook page, I have been introducing the new felt pups as they are created. 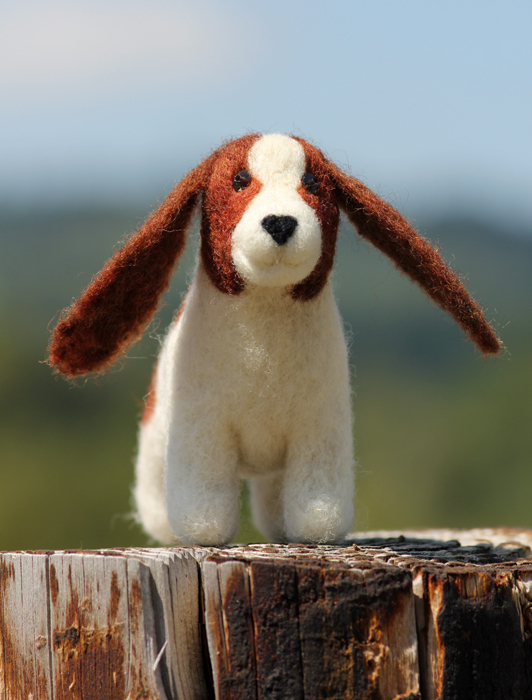 This particular felt pup is near and dear to my heart and needed her own blogpost. Here she is in her later years. I wasn’t supposed to get a puppy, my parents were getting a puppy for my younger brother, but I got impatient waiting in the car. I walked into the area where the puppies were and she crawled out from under a ledge and I knew she had to come home with me. One of the things I will always be grateful for is that my parents let me bring her home. My brother came home with her brother, Willy. 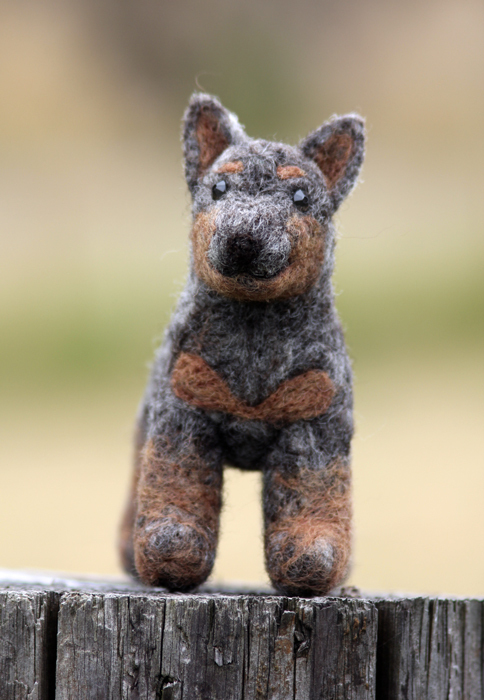 This makes Felt Pup #42 that I have made. With orders stacking up and Christmas gifts being ordered, she wasn’t on my list to make, but the universe works in mysterious ways. 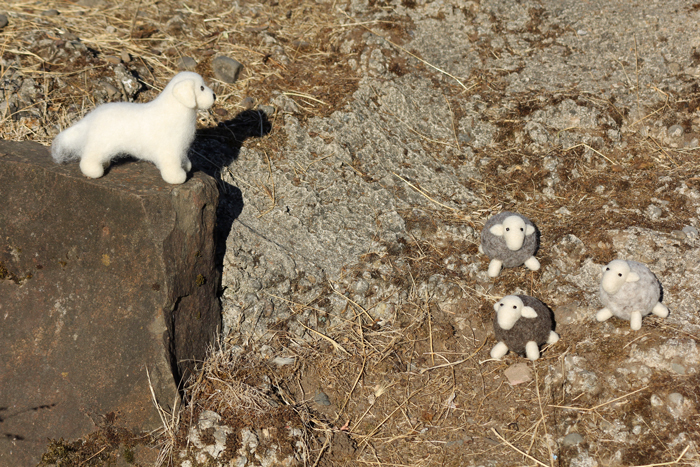 My mom has been bugging urging me to make a ‘Kenzie’ for my little mascot and I kept saying, at some point I will make a ‘Kenzie’, but not right now. 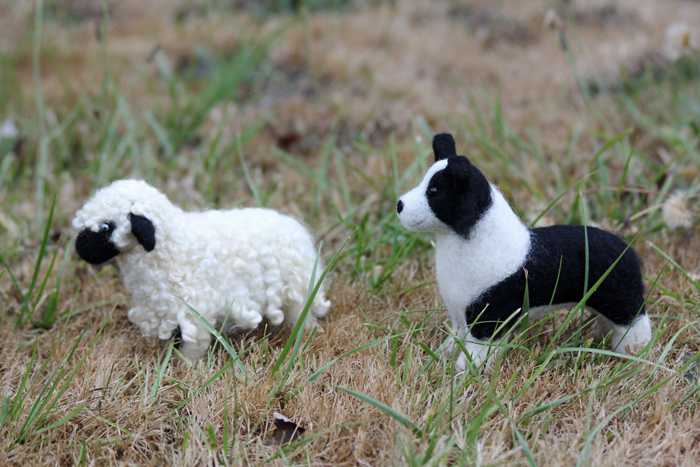 Earlier this week, I was working on a Border collie that ended up turning into a ‘custom’ Border collie and the coloring wasn’t close to the same. Funny thing is that the coloring was exactly what Kenzie looked like. 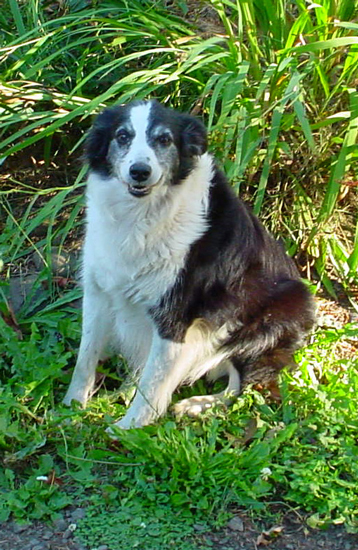 She was a Border collie/Aussie mix and had a natural bob tail. She used to love bringing the horses in and she would have thoroughly enjoyed the sheep chores, unfortunately we didn’t have the sheep before she passed away. 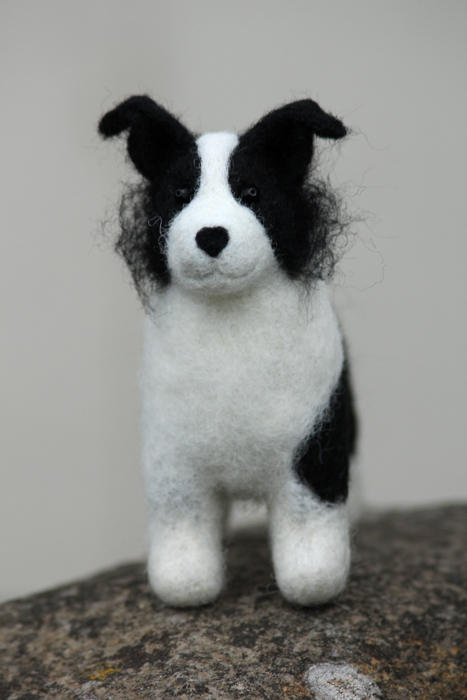 She can now sit on my desk, keeping me company and herding the little felt sheep. 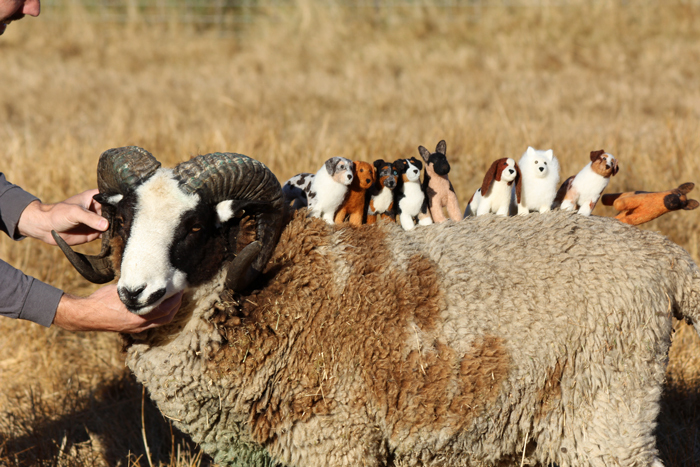 It all started on July 27th when I posted photos of a felt dog that I made as a ‘thank you’ gift for someone who went above and beyond for us. 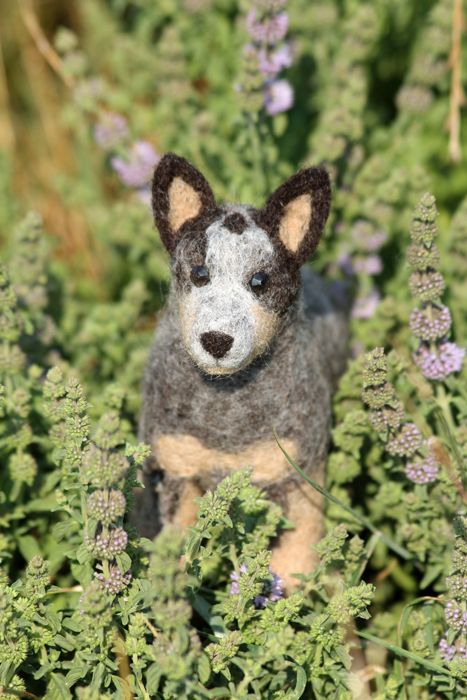 Say ‘hello’ to Doc, a Blue Heeler. 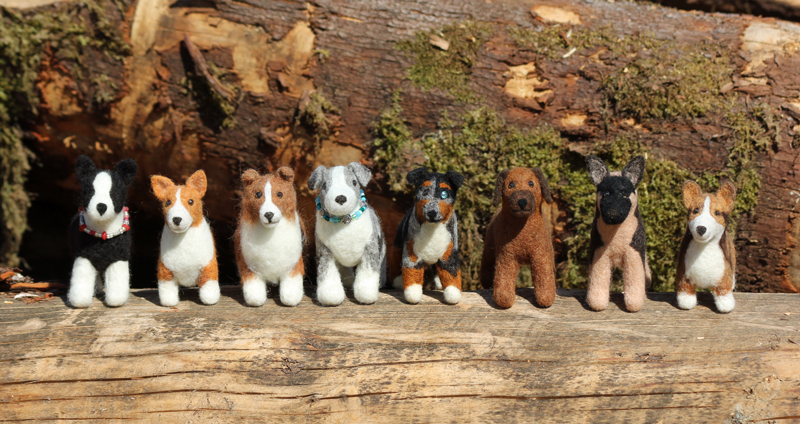 I posted photos on my Kenleigh Acres Facebook page and the orders started coming in and the dogs started moving out! 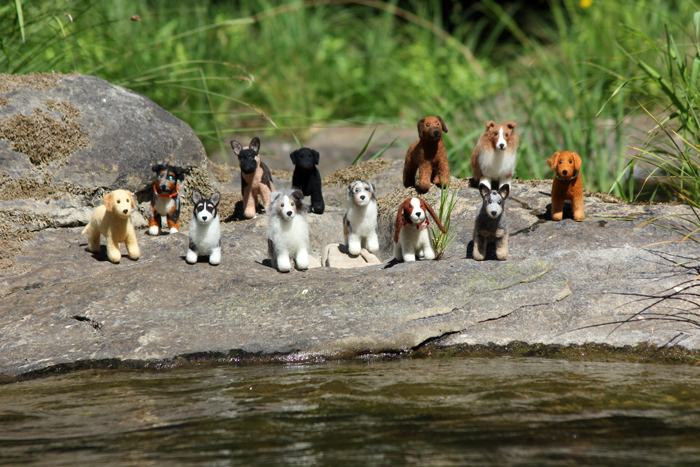 Some of them have been special replicas of dogs that have moved on and left a hole in their owner’s hearts. This is Kodi. She was a very special dog for my sister and I can remember hiding her in my room as a tiny puppy for a few days before Christmas, many years ago. More dogs and another group shot. 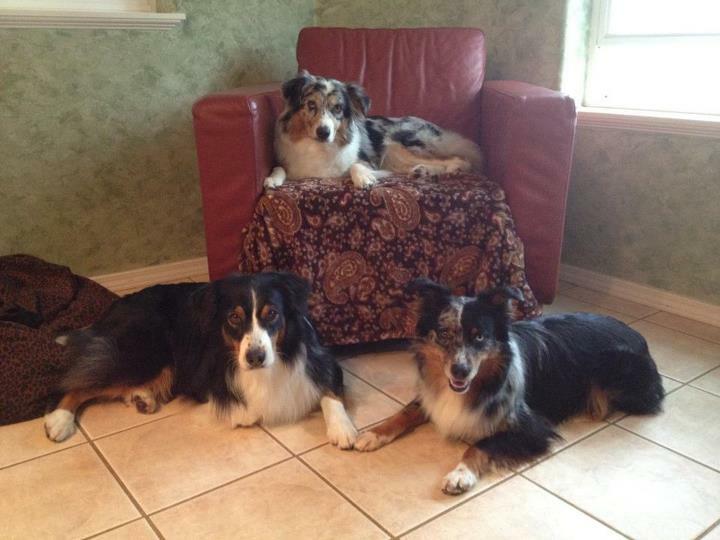 Some of the dogs are serious workers, much like they are in life. 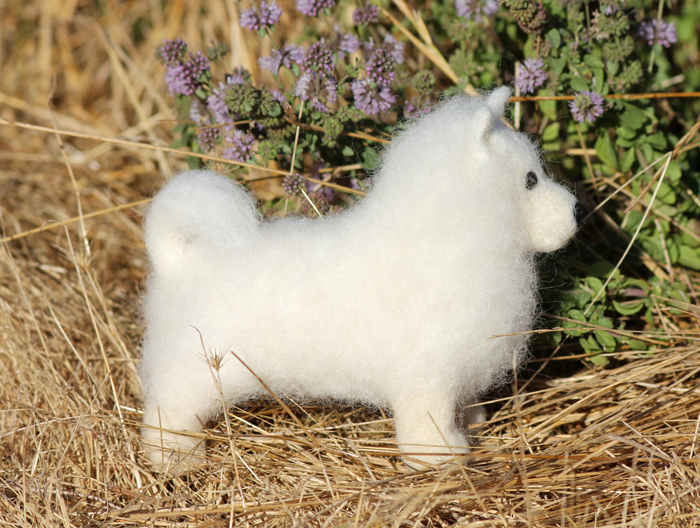 When I finished this American Eskimo, I went to bed thinking about where I wanted to take a picture of it the next morning. 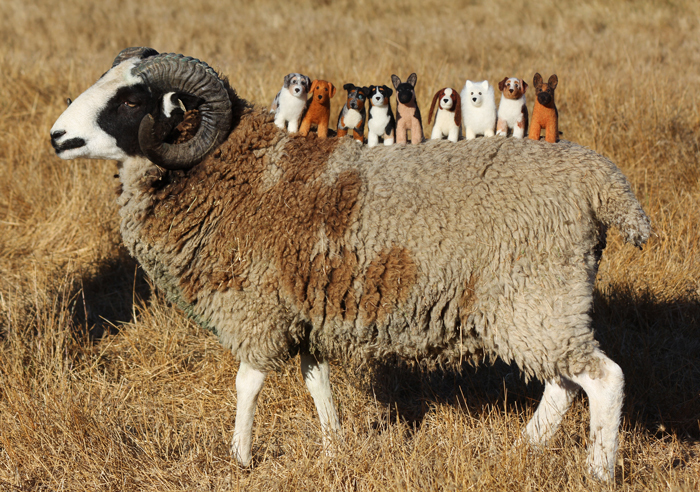 My mind went on a creative tangent and my poor husband woke up to me asking him if he could help me take another group shot of the dogs on the back of one of our sheep! Bless his heart, he just kind of shook his head and said ‘sure’. 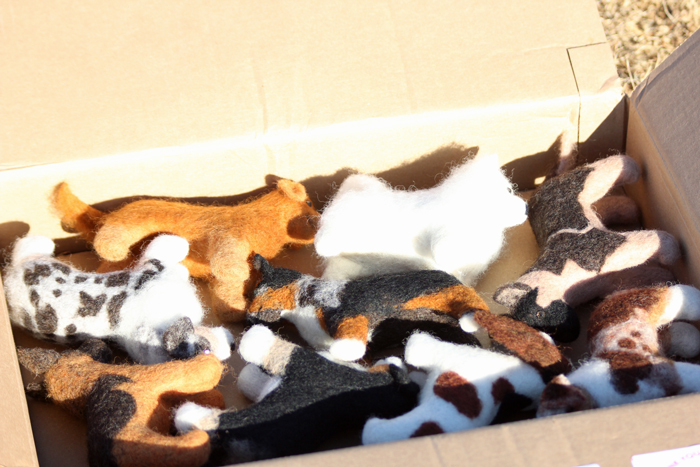 So, we boxed up the pups and headed out to the pasture. 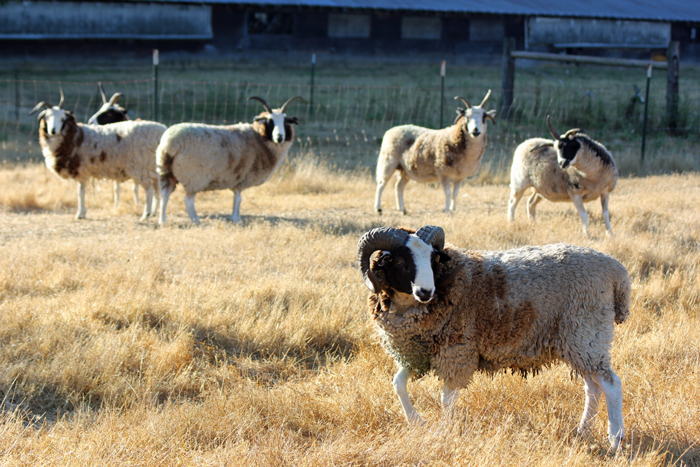 An adult ram in a breeding group isn’t the sheep I would normally choose, but Aragon isn’t really a ‘normal’ ram. My husband scratched his chin while I set the dogs on his back. Aragon just kind of melts and goes into a trance when you touch him. Perfect for taking photos! I now have a sign to take with me to the upcoming fiber shows. 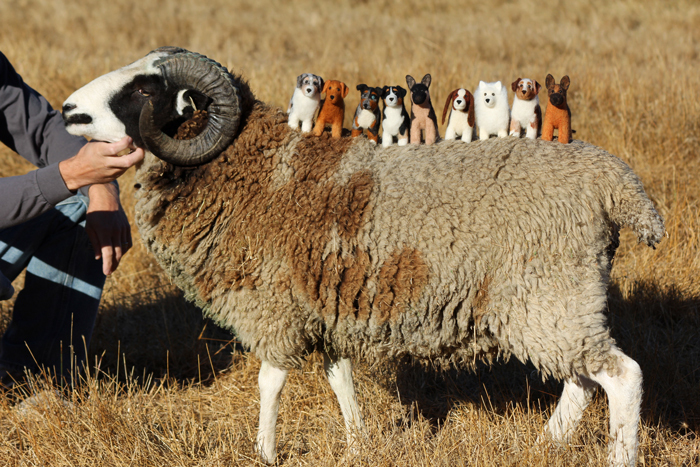 I love that my passion for sheep and dogs have collided in such a fun way! 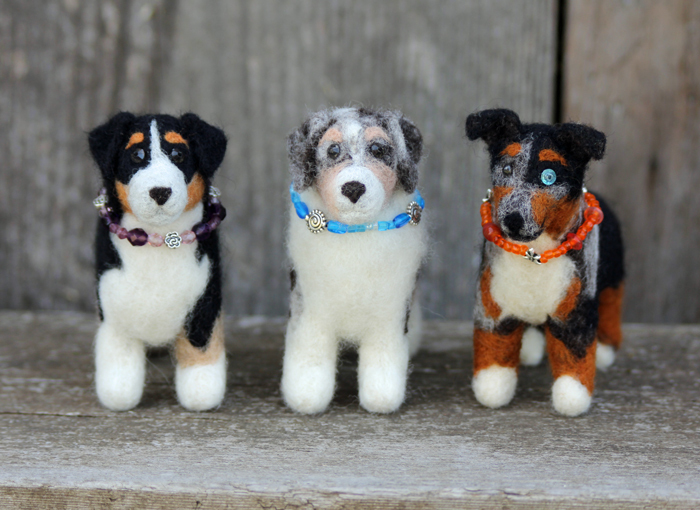 All of the dogs can be seen on my Kenleigh Acres Facebook page.